They are by their nature, their very mission, their objective, terrorist orgs, so this is expected. The BDS movement is, despite its claims to stand for human rights, a movement that is built on hatred for the State of Israel and for Jews in general. It is a Nazi-like movement to boycott Jewish businesses, just as the Nazis did. So it is no surprise that BDS groups would have ties to jihad terror groups. That so many mainstream figures would attach themselves to a genocidal movement is a whole other thing, but it makes the run up to the Holocaust seem entirely more real. The BDS movement is an obvious emulation of the Nazis, who began their actions against the Jews with boycott of Jewish-owned businesses. It is also an attempt to legitimize and give a patina of righteousness to what is in its essence a jihad operation with aims that are frankly and often avowedly genocidal. And the Left in the West has bought into it in a big way. The Ministry of Strategic Affairs revealed over 100 links between terror groups and BDS-promoting NGOs, including the employment of 30 current and “retired” terror operatives. The Ministry of Strategic Affairs and Public Diplomacy (MSA) released its “Terrorists in Suits” report on Sunday, revealing over 100 links shared between the internationally-designated terrorist organizations Hamas and the Popular Front for the Liberation of Palestine (PFLP) with at least 13 anti-Israel BDS promoting NGOs. Elaborating on a previous report, the ministry reveals how Hamas and the PFLP are utilizing a network of NGOs promoting boycotts against Israel as an additional tactic in their ultimate goal of dismantling the State of Israel. These organizations have successfully placed over 30 of their members, 20 of which have served time, including for murder, in senior positions within BDS-promoting NGOs. The report documents how boycott organizations and terrorist designated organizations raise finances together, share the same personnel, and showcases that contrary to popular belief, these officials have not abandoned their support for terrorism, but instead, continue to maintain organizational, financial, and active ties with terrorist groups. Examples of terrorists working in support of organizations that promote the boycotting of Israel include Leila Khaled and Mustafa Awad. Awad, is currently serving time for his involvement in several terrorist organizations, including serving as a member of the PFLP and received training from Iranian terrorist group Hezbollah. He also represented Samidoun in Brussels, an organization known for promoting boycotts against the State of Israel and advocating for the release of Palestinian security-prisoners in Israeli jails, including those convicted of murdering civilians in terrorist PFLP attacks. 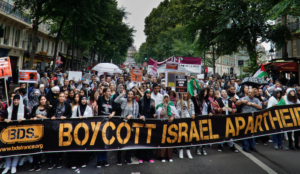 Another instance includes the BDS National Committee (BNC), the Ramallah-based leadership of the global Boycott movement toward Israel, consists of 28 Palestinian boycott groups. The lead member of this coalition is the Palestinian National and Islamic Forces (PNIF), which includes five internationally-designated terrorist organizations including Hamas, the Popular Front for the Liberation of Palestine and Palestinian Islamic Jihad. The American fundraising platform Donorbox recently suspended the BNC’s account after finding the group did indeed maintain ties to terrorist groups. The report also showed how members of terrorist organizations operate under the guise of “boycott activists” to gain access, and meet with, senior Western government officials and exert pressure to release convicted terrorists held in Israeli prisons….